The woman took the fruit, took a bite out of it, then handed it to her husband. He took a big bite, too. Then their eyes were opened and they saw that they were naked, and they were ashamed. It’s the old, old story of how we lost the glory. The man and woman—”Adam and Eve” after the fact—took and ate what was not given them to eat. When they took and ate what was not for them, they turned from God to themselves, and in that moment they saw in each other their nakedness. The man and woman were exposed. Vulnerable. In the eating they had become like God, but they were not God. They had no power to undo their taking forbidden fruit for themselves. They were incapable of covering their shame. They knew what they’d done was evil, but since they were only “like” God, there was no way for them to go back and replace evil with good. God’s one command to them was broken, and there was nothing they could do except stare dumbly at each other and try, futilely, to hide from God. And for their trouble, God laid on them a reminder of their rebellion and need for a Savior. For the woman, greatly increased pain in childbirth. For the man, thorns and thistles would erupt from the ground to cause his hands pain when he worked it. 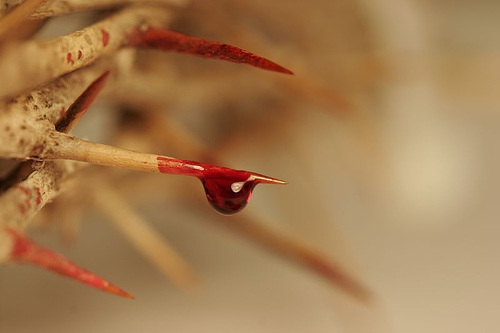 We don’t often pay attention to the link between the thorns and pain of Genesis 3 and Jesus’ crucifixion, even though it’s an important connection. Jesus had a crown of thorns placed on His head. That was unique to Jesus. The Romans would whip someone before they crucified him. That was a common practice. Others had been crucified for their crime. That was a common way the Romans punished law-breakers. Jesus was treated no more or less special than any other criminal. But the crown was for Him alone. He claimed to be a king, sure. But there is a deeper reason for the crown, and it has everything to do with it being made of thorns. The Romans never crowned anybody else with thorns. Jesus takes the thorns upon his head so that when we suffer the “pain of the work of our hands”, our flesh and blood suffering the ravages of sin, we are pointed toward Golgotha. At the same time, we are reminded of the giftedness of Jesus’ body and his blood. Now, when we come into the presence of our Lord, “take and eat” isn’t a reminder of our first parents’ cursed decision to become like Almighty God. It is a present tense act of salvation done by our Savior God for us. Sin would have us take for ourselves all that we need for this body and life by the sweat of our brows. Jesus would have us receive Himself for all that we need for this body and life, and life everlasting, by His bloody sweat. The man and woman committed themselves to being like God—all their emotions, and thoughts, and will—and for their effort, pain and thorns became their destiny. Now, because God so loved the world that He committed His only begotten Son to becoming one of us—fully man possessed of all our emotions, and thoughts, and will—for Jesus’ pain and thorny crown, our eternal destiny is to be restored to a Genesis 2-like creation at the Last Day.